Purpose: This study aimed to evaluate the changes in macular thickness following inferior oblique muscle recession surgery. Materials and Methods: Thirty-eight eyes from 21 patients undergoing ocular muscle surgery were included. Patients were grouped into three groups based on the type of surgical intervention: Group I (n = 12), inferior oblique recession surgery alone; Group II (n = 12), inferior oblique plus horizontal muscle surgery; Group III (n = 14), horizontal muscle surgery alone. Each eye was scanned using the optical coherence tomography (OCT) device preoperatively and on the first postoperative day to measure macular thickness. Results: Following surgery, a significant increase in foveal thickness occurred in Group I (P < 0.05) and Group II (P < 0.01). In addition, a statistically significant difference was observed between the groups with regard to the increase in foveal thickness (P = 0.016), with significantly lower changes in Group III. Conclusion: Our findings suggested that inferior oblique muscle recession surgery is associated with an increase in macular thickness. For many years, inferior oblique (IO) muscle recession surgery has been among the most preferred weakening procedures. According to Parks, it is the most effective and long lasting of the IO weakening procedures. However, inferior oblique muscle lies in close proximity to the macula; thus, macula might be injured during the recession of IO muscle. 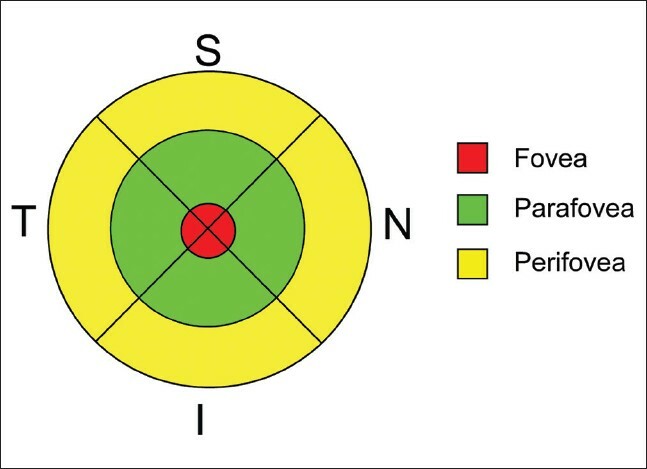 In a human donor study, the distance between fovea and the posterior-inferior and anterior-inferior border of IO were 2.5 ± 0.8 mm and 11.0 ± 1.0 mm, respectively. Therefore, more caution should be exercised during IO recession surgery when compared to horizontal muscle surgery, since tractions during exploration and release of this muscle may have potential effects on macula. Optical coherence tomography (OCT) is an interferometric technique that produces a cross-sectional view of the retina, based on the reflectivity of different layers within the retina. , OCT is the most commonly used imaging technique for macular examination, since it represents the only imaging modality allowing direct visualization of the layered retinal structures. ,, Advances in OCT technology have provided an objective and quantitative method to evaluate macular thickness and volume. In this study, the objective was to examine the possible traumatic effect of the recession of IO on the macula, due to close anatomical association between the insertion point of the inferior oblique muscle. The study protocol was approved by the Institutional Ethics Committee, and the study was conducted in accordance with the Declaration of Helsinki. Prior to inclusion, informed consent was obtained from all subjects or their legal representatives. Thirty-eight eyes from 21 patients, aged between 5 and 34 years (mean age: 5.79 ± 9.07 years), were imaged using an RTVue-100°CT device (Optovue Inc., Fremont, CA, USA). Patients undergoing IO muscle recession surgery alone comprised Group I (n = 12), while patients undergoing horizontal muscle surgery in addition to IO recession surgery comprised Group II (n = 12), and those who underwent horizontal muscle surgery alone comprised Group III (n = 14). Corrected and uncorrected visual acuity, cycloplegic refraction value, biomicroscopic examination, and dilated fundus examination were performed in all patients pre- and postoperatively. The inclusion criteria were as follows: (i) age between 5 and 34 years, (ii) no prior history of ocular surgery or trauma, (iii) spherical equivalent refractive error of not greater than 3 diopters, (iv) normal ocular examination findings (v) no medical or family history of retinal disease, glaucoma or diabetes mellitus. Patients with orbital and/or craniofacial abnormalities were excluded. All surgical interventions were performed by one of two different surgeons (ETV or HB) under general anesthesia. For IO muscle recession surgery, following placement of conjunctival traction suture from lower temporal quadrant to limbus, the eye was deviated toward superonasal quadrant. Incision was performed through inferotemporal conjunctiva 8 mm apart from the limbus. Blunt dissection was continued until sclera was exposed. Then inferior oblique muscle was dissected from the surrounding tissues by using two strabismus hooks. First, the muscle was clamped near the insertion and then cut and the ends were cauterized. The inferior oblique muscle was sutured 3 mm back and 2 mm lateral part of temporal side of inferior rectus muscle insertion. For horizontal muscle surgery, conjunctiva was opened through an approach from limbus and the muscle was identified using strabismus hooks. The tendon was removed via blunt dissection and in cases that would undergo recession the site of insertion was cut with cautery and sutured to the sclera with 6/0 vicryl suture. In cases that would undergo resection, the muscle was cut using cautery at the site of resection and sutured to the sclera using 6/0 vicryl suture. In order to achieve higher resolution and faster scanning than traditional OCT machines, we used the RTVue-100, a Fourier-domain (FD) OCT system. FD-OCT represents a recent advance in OCT providing increased resolution and scanning speed via a Fourier-domain spectrometric method. This is different from the conventional method, which involves the adjustment of the position of a reference mirror. ,, Therefore, FD-OCT's resolution is up to 5 times higher and imaging speed is up to 100 times faster than conventional time-domain OCT. ,, The RTVue-100 FD-OCT system uses an 840-nm scan beam capable of imaging 26,000 A scans/s with a depth resolution of 5 μm and a transverse resolution of 15 μm. Each eye was scanned using the FD-OCT device after pupils were dilated, preoperatively and on the first postoperative day. Each OCT scan was centered on the fovea by providing a central, internal fixation mark. Foveal, parafoveal and perifoveal thicknesses were measured. [Figure 1] depicts foveal, parafoveal and perifoveal regions. All OCT scans had at least ≥70% of the maximum signal strength, and there were no layer segmentation errors. Scans with low quality and/or a failing retinal thickness algorithm were excluded, and measurements were repeated until good quality scans were obtained. In addition, scans with blinks during the scanning process were also excluded and repeated. Each scan was separately analyzed using the automated retinal thickness algorithm to generate retinal thickness values in micrometers. A high-resolution radial line scan protocol, consisting of 12-line scans (512 scans/line) intersecting in the fovea, was employed. Data were analyzed using Number Cruncher Statistical System (NCSS) 2007 and Power Analysis and Sample Size (PASS) 2008 statistical software (Kaysville, Utah, USA). Age and gender distribution of the groups were compared using Kruskal-Wallis and Chi-square tests, respectively. Along with descriptive statistical methods (mean, standard deviation), a paired-samples t-test or Wilcoxon signed rank test was used for intra-group comparisons of the quantitative data. 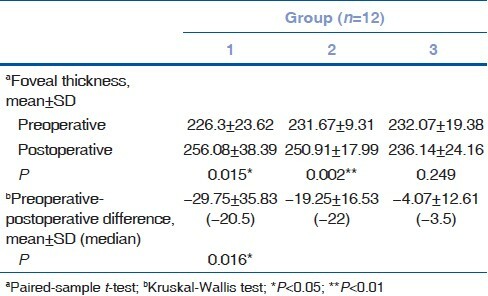 Groups were compared with regard to the differences between preoperative and postoperative results using Kruskal Wallis test, and the Mann-Whitney U test was employed for the determination of the differing group. A P < 0.05 was considered as an indication of statistical significance. There were no statistically significant age and gender differences between the groups (P = 0.279 and P = 0.221, respectively). No significant changes were observed in postoperative corrected and uncorrected visual acuity. No change was determined between preoperative and postoperative refractions of the cases. The foveal thickness measurements are given in [Table 1]. Mean postoperative foveal thicknesses was significantly higher as compared to the preoperative thickness in Group I and Group II (P = 0.015 and 0.002, respectively), while no such difference was found for the foveal thickness in Group III (P = 0.25). A statistically significant difference was observed between the groups with regard to the increases in foveal thickness (P = 0.016). Paired comparisons that have been performed to identify the cause of difference showed a significantly lower difference between pre- and postoperative foveal thickness in Group III than in the other two groups (P = 0.017; P = 0.011, respectively). Although there were no significant differences between groups preoperatively in terms of parafoveal thickness (P ≥ 0.05), a significantly higher thickness was measured postoperatively in Group II as compared to Group III (P = 0.007). No significant within-group changes were observed between preoperative and postoperative parafoveal measurements in any of the groups (P ≥ 0.05 for all). Preoperative perifoveal thicknesses were similar among the three groups (P ≥ 0.05 for all). However, postoperative perifoveal thickness was significantly lower in Group III, as compared to Group I and II (P = 0.025 and P = 0.018, respectively). In addition, a significant difference was found between preoperative and postoperative perifoveal thickness in Group I and II (P = 0.03 and 0.02, respectively), but not in Group III (P = 0.46). This study examining the early postoperative changes in foveal, perifoveal, and parafoveal thickness after IO muscle recession surgery found significant increases in foveal thickness following the surgical procedure in Group I (IO muscle recession surgery only) and in Group II (horizontal muscle surgery plus IO muscle recession surgery), but not in Group III (horizontal muscle surgery alone). Modern inferior oblique muscle recession surgery is regarded to be a safer procedure than the horizontal and vertical muscle surgeries. Inferior oblique recession surgery is associated with decreased risk of intraocular complications such as globe perforation, retinal tears, and retinal scarring as compared to other approaches. , On the other hand, bilateral macular burns were reported to occur due to the use of monopolar cutting diathermy during inferior oblique myectomy, in a case report of two patients. In addition, other complications such as temporary internal ophthalmoplegia and retrobulbar hemorrhage have been reported. , From the surgeon's point of view, inferior oblique muscle recession surgery may represent a cause for concern due to the close anatomical relation between the insertion point of this muscle and macula. In this regard, Kasem et al. found no significant macular changes after inferior oblique surgery with OCT.  One possible explanation for this difference in our study, the reason for measuring the macular thickness differently is surgical trauma and traction. The most important reason of this trauma is the traction applied by us during the attempt to find the muscle and to separate it from the tendon tissue in inferior oblique muscle surgery. In addition to this, also strength of cautery and the duration of application increase the macular trauma. These probable trauma reasons might have caused macular trauma much more during our surgery. To find and expose the inferior oblique muscle can be difficult during surgery. However, macular complications can be prevented with more gentle and more careful surgery. Scar formation after Faden surgery is generally explained by the mechanically irritating factors. Choroidal ischemia occurring after compression of the posterior ciliary arteries is somehow similar to the mechanism of Herpburn-Amalric syndrome, which is associated with edema and inflammation. In our study, traction and globe compression inflicted upon the muscle might have led to compression of the short posterior ciliary arteries by a similar mechanism. Thus, a clinically asymptomatic macular thickening and volume increase were observed in our cases. Higher resolution of FD-OCT used in our study as compared to other OCT methods might have allowed us to demonstrate these minimal changes. We believe that our results are particularly important in terms of the need to avoid blunt trauma of the globe with hooks during this specific type of surgery and emphasizes the importance of careful monitoring of the muscle traction. Major limitations of our study include the small sample size and possible inter-operator variability due to inclusion of two different surgeons in the study. Another limiting factor of our study is the short follow-up period. Parks MM. The weakening surgical procedures for eliminating overaction of the inferior oblique muscle. Am J Ophthalmol 1972;73:107-22. Feng X, Pilon K, Yaacobi Y, Olsen TW. Extraocular muscle insertions relative to the fovea and optic nerve: Humans and rhesus macaque. Invest Ophthalmol Vis Sci 2005;46:3493-6. Varma R, Bazzaz S, Lai M. Optical tomography-measured retinal nerve fiber layer thickness in normal latinos. Invest Ophthalmol Vis Sci 2003;44:3369-73. Menke MN, Dabov S, Sturm V. Comparison of three different optical coherence tomography models for total macular thickness measurements in healthy controls. Ophthalmologica 2009;223:352-6. Sung KR, Wollstein G, Bilonick RA, Townsend KA, Ishikawa H, Kagemann L, et al. Effects of age on optical coherence tomography measurements of healthy retinal nerve fiber layer, macula, and optic nerve head. Ophthalmology 2009;116:1119-24. Srinivasan VJ, Wojtkowski M, Witkin AJ, Duker JS, Ko TH, Carvalho M, et al. High-definition and 3-dimensional imaging of macular pathologies with high-speed ultrahigh-resolution optical coherence tomography. Ophthalmology 2006;113:2054 e1-14. Alam S, Zawadzki RJ, Choi S, Gerth C, Park SS, Morse L, et al. Clinical application of rapid serial fourier-domain optical coherence tomography for macular imaging. Ophthalmology 2006;113:1425-31. Wolf-Schnurrbusch UE, Ceklic L, Brinkmann CK, Iliev ME, Frey M, Rothenbuehler SP, et al. Macular thickness measurements in healthy eyes using six different optical coherence tomography instruments. Invest Ophthalmol Vis Sci 2009;50:3432-7. Johnson DE, El-Defrawy SR, Almeida DR, Campbell RJ. Comparison of retinal nerve fibre layer measurements from time domain and spectral domain optical coherence tomography systems. Can J Ophthalmol 2009;44:562-6. Lim JI, Tan O, Fawzi AA, Hopkins JJ, Gil-Flamer JH, Huang D. A pilot study of Fourier-domain optical coherence tomography of retinal dystrophy patients. Am J Ophthalmol 2008;146:417-26. Dang Y, Racu C, Isenberg SJ. Scleral penetrations and perforations in strabismus surgery and associated risk factors. J AAPOS 2004;8:325-31. Morris RJ, Rosen PH, Fells P. Incidence of inadvertent globe perforation during strabismus surgery. Br J Ophthalmol 1990;74:490-3. Burton BJ, Hamilton AM. Inferior oblique myectomy using monopolar cutting diathermy resulting in bilateral retinal scarring. Br J Ophthalmol 1999;83:374-5. Ares C, Superstein R. Retrobulbar hemorrhage following strabismus surgery. J AAPOS 2006;10:594-5. Bladen JC, Moosajee M, Angunawela R, Roberts C. Transient internal ophthalmoplegia after inferior oblique myectomy. J AAPOS 2009;13:596-7. Kasem MA, Sabry D. Detection of macular changes by optical coherence tomography after inferior oblique muscle surgery. J AAPOS 2011;15:334-7. Alio JL, Faci A. Fundus changes following faden operation. Arch Ophthalmol 1984;102:211-3.